This week’s blog story in honor of all of us, every single American who has benefited by the “radical ideas” of this woman. We owe much to her legacy. What’s old is new again. But for very different reasons. Inequalities and attacks on our constitution are at the forefront of today’s news. Let’s keep up the “good fight” and continue the progress made a century ago. 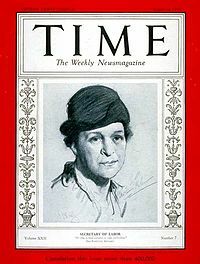 When Frances Perkins was a little girl, she asked her parents why nice people could be poor. Her father told her not to worry about those things, and that poor people were poor because they were lazy and drank. Eventually, she went to Mount Holyoke College, and majored in physics. In her final semester, she took a class in American economic history and toured the mills along the Connecticut River to see working conditions. She was horrified. Eventually, instead of teaching until she married, she earned a master’s degree in sociology from Columbia University. In 1910, Perkins became Executive Secretary of the New York City Consumers League. She campaigned for sanitary regulations for bakeries, fire protection for factories, and legislation to limit the working hours for women and children in factories to 54 hours per week. She worked mainly in New York State’s capital, Albany. Here, she made friends with politicians, and learned how to lobby. On March 25th, 1911, Frances was having tea with friends when they heard fire engines. They ran to see what was happening, and witnessed one of the worst workplace disasters in US history. 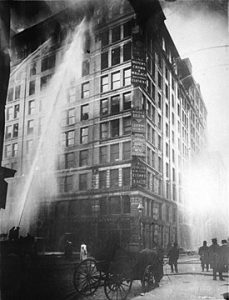 The Triangle Shirtwaist Factory fire was devastating, killing 146 people, mostly young women and girls. 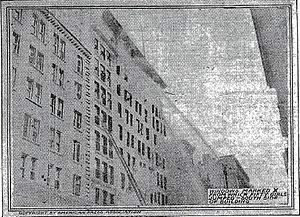 Frances watched as fire escapes collapsed and fireman ladders couldn’t reach the women trapped by the flames. She watched 47 workers leap to their deaths from the 8th and 9th floors. Poignantly, just a year before these same women and girls had fought for and won the 54 hour work week and other benefits that Frances had championed. These women weren’t just tragic victims, they were heroes of the labor force. Frances at that moment resolved to make sure their deaths meant something. 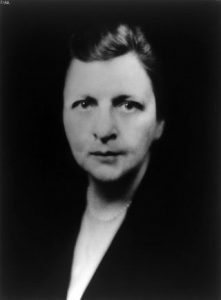 A committee to study reforms in safety in factories was formed, and Perkins became the secretary. The group took on not only fire safety, but all other health issues they could think of. Perkins, by that time a respected expert witness, helped draft the most comprehensive set of laws regarding workplace health and safety in the country. Other states started copying New York’s new laws to protect workers. 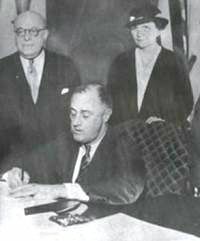 Francis Perkins continued to work in New York for decades, until she was asked by President Elect Franklin D. Roosevelt in 1933 to serve as Secretary of Labor. She told him only if he agreed with her goals: 40-hour work week, minimum wage, unemployment and worker’s compensation, abolition of child labor, federal aid to the states for unemployment, Social Security, a revitalized federal employment service, and universal health insurance. He agreed. Similar to what she had worked for in New York, her successes became the New Deal, and changed the country and its workers forever. Look over this list again. Notice something missing today? Notice anything else? So, while you may not know her name, you certainly know her legacy. 100 year after the tragedy, a “Remember the Triangle Fire Coalition” was formed. 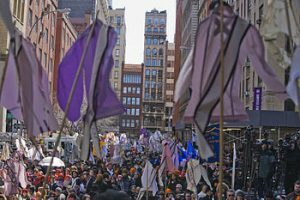 The commemoration drew thousands of people, many holding aloft “146 Shirtwaist-Kites” conceived by artist Annie Lanzillotto and designed and fabricated by members of The Remember the Triangle Fire Coalition, with the names of the victims on sashes, as they listened to speakers. The ceremony, which was held in front of the building where the fire took place, was preceded by a march through Greenwich Village by thousands of people, some carrying shirtwaists – women’s blouses – on poles, with sashes commemorating the names of those who died in the fire.